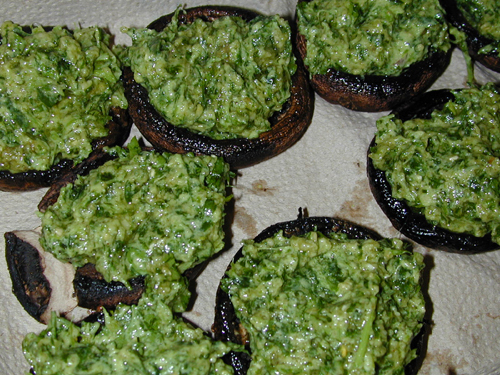 I’ve been thinking about making pesto stuffed mushrooms for a while now, at least since considering the dish as worthy of a Food Network competition. Then I was at the store and saw the beautiful criminis. Usually they have the smaller ones, but sometimes they have ones almost big enough to be called portabellas. If they were a little bigger, they would be, since criminis are just less mature portabellas. Same type of mushroom. Wash the mushrooms and gently remove the stems and the fleshy part over the gills (chop the stems etc and put aside for a stir-fry another day). 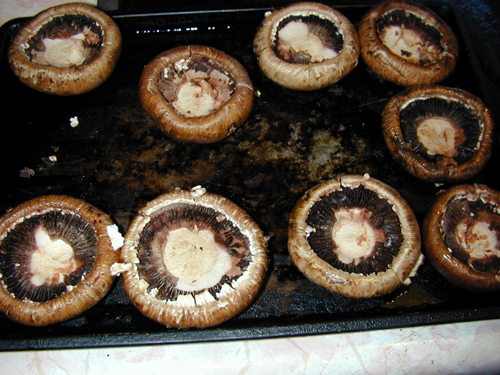 Lightly oil a baking pan, place the mushrooms gill down on the pan to get some oil then flip to roast on their backs. To make this a raw dish, fill the mushrooms as is (when dry) or perhaps dehydrate them until soft (I haven’t tried this). Bake until soft but still strong enough to pick up with your fingers. About 15 minutes at 350*F, but go by doneness, not time. Turn them over to dump the accumulated liquid (I poured it into some root vegetables I was also roasting) and leave them upside down on the dry pan to cool. Then put a heaping spoonful of pesto in each mushroom. I used my basic vegan pesto recipe made with extra pine nuts and nice and thick. Serve warm, room temperature, or cold. I chilled mine then brought them on a picnic at the Marin County Fair.